Low prices. OrangeSmile.com offers car hire service in Slovenia on the lowest-rate-guarantee basis, since we work with car suppliers directly. 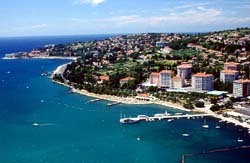 For your search criteria in Slovenia, we always select and show the best rental offers. The car reservation process consists of 3 simple steps: (1) search for available cars for your dates in Slovenia; (2) select your car type; and (3) fill in the booking forms. Once the reservation is completed, you will receive a confirmation voucher to your email address. During the booking process, please check your rental conditions. To pick up your car at the rental point in Slovenia, you need to provide our confirmation voucher, your driving license and a valid credit card. The final payment is normally carried out at the pick-up point. Our car hire points in Slovenia accept VISA, MasterCard, etc - please check your rental conditions. At the pick-up point, please read the handling manual and check the car for present defects. OrangeSmile.com wishes you a pleasant journey to Slovenia! The car hire reservation system OrangeSmile.com allows renting a vehicle in Slovenia within 10 minutes. Our largest database of car suppliers enables us to provide you a rental car in Slovenia at the cheapest rate ever possible. At rental locations in Slovenia we offer the following car sizes: mini, compact, economy, standard, premium and luxury. The following car types are available in Slovenia: Sedan, Hatchback, Jeep, Cabriolet, Coupe, Minivan and Minibus. Slovenia has long become a favorite place of rest among fans of eco-tourism, alpine ski and interesting excursions. The country is so diverse that every vacation there will be unique and unforgettable. Those, who want to get acquainted with culture and landmarks of the country, are recommended to start from prominent places of Ljubljana. In this city travelers will find several hundred medieval buildings, the most famous of which being the Ljubljana Castle. First mentions of the castle belong to the middle of the 12th century, but, according to historians, it was built way earlier. Initially, the castle was built as a protective facility. In the 17th century it was transformed into a hospital, and later - into a prison. Nowadays, the castle has become a museum complex, where travelers will find a picture gallery, the Museum of History and outlets with crafts made by local masters. In summer, the castle often becomes the venue for different musical performances and concerts. The history of the Saint Nicolas Cathedral is very interesting and unusual. In the 12th century, a small wooden church stood on the site of the modern cathedral, but it was completely destroyed by fire. Two centuries later, the construction of a cathedral started on the same site, but it was not ended as the unfinished cathedral was also destroyed by fire. Only in the 18th century a beautiful cathedral was built on the square. This is the cathedral we can see now. Besides interesting architectural landmarks, there is a wonderful botanic garden in Ljubljana. It was founded yet in 1810 and since that time it has become the biggest botanic garden in the country. Here visitors will find more than 4,500 plants from different parts of the world, which make the garden an important object on international level. Not only tourists, but also scientists visit the garden to see and study rare plants from a professional point of view. Travelers with kids will be delighted to visit the local zoo, which has become home for more than 600 species of animals, birds and reptiles. Do not forget to visit Novo Mesto, a wonderful city, the main symbol of which is Stari Grad (the Old Castle). The castle was built 7 centuries ago, and today its visitors are welcome to see its magnificent halls, walk in long corridors and enjoy panoramic views of the city from an observation deck, which is made in front of the castle. One more grandiose medieval castle is located in the city of Ptuj, which halls host galleries of modern art and inner yard has become a popular venue for different events.